Over the past decade, we’ve all watched the world’s energy markets shift towards cleaner, alternative sources. Technological advancements in renewable industries like wind, solar, and tidal, have enabled us to make these potential solutions a reality. As research and development continue to improve efficiency, and drive down cost, these solutions will become more and more prevalent. We still face considerable obstacles. Wind turbines, in particular, take on one of the largest hurdles; weather. Their fixed location poses unique challenges for turbine and blade manufacturers, which are expected to increase the longevity and reliability of their products without compromising effectiveness, or substantially raising costs. 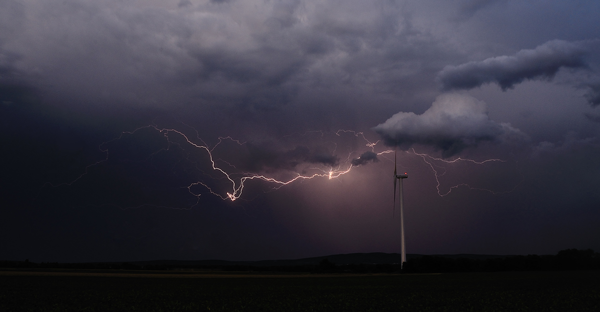 Lightning strikes can cause significant damage to turbines. 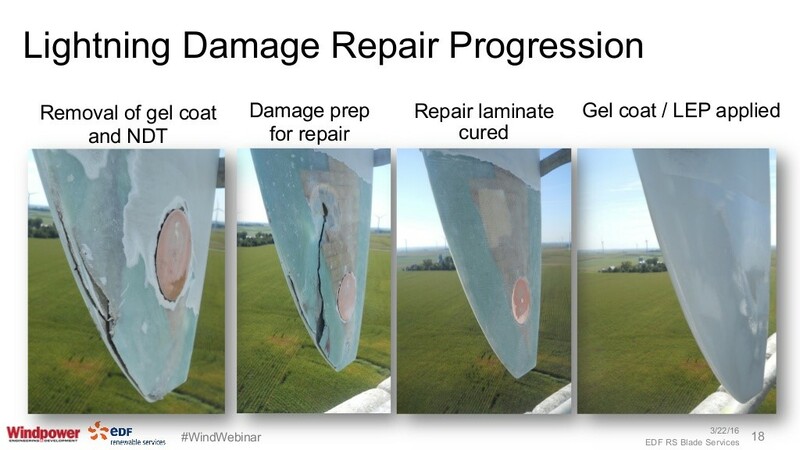 This damage is extremely expensive to repair, and can shut a turbine down completely. Severe storms are generally comprised of one or more cumulonimbus clouds, which can be several kilometers in height. As these clouds develop, warm air rises towards the top of the cloud. As the air rises, it becomes cooler. At the dew point, excess water vapor condenses into water droplets and forms the cloud. When the air has risen high enough, the temperature can drop to -40 degrees Celsius – water vapor within the cloud will freeze. As ice crystals and hailstones form, and become heavier, they fall through the cloud. When additional water droplets freeze onto the hailstone, small splinters of ice chip off, many of which are positively charged (electrically). Together, these can deposit a net negative charge. Vertical winds carry these smaller splinters upwards into the cloud, while the hailstone falls until it reaches warmer air. This process causes pockets of electrical charge to form within the cloud, which creates strong electric fields. These electric fields allow charge from the surface of the earth to be “pulled” upwards. in an effort to become charge neutral (typically through tall objects and structures). As these charges get closer together, the electric field in the air further intensifies until it reaches levels of ~30,000V/cm. When the field intensity reaches these levels, air begins to break down, allowing charge (in the form of current) to flow through the air. Sharp objects significantly intensify the electric field, forming corona (also called St. Elmo’s Fire). Charge from the lightning cloud begins propagating towards the earth. At some point, charge from objects on the ground begins flowing upwards. When these two flows meet, a conductive channel is formed, and lightning occurs. During a lightning strike, currents of up to (and even greater than) 200,000A travel between the cloud and the object where the lightning channel formed. Wind turbine blades have a sharp, aerodynamic profile – this not only allows them operate efficiently; it also makes them extremely susceptible to lightning strikes. Without suitable conduction paths to safely carry such high current, this transfer of energy can devastate a wind turbine blade. Most wind turbine manufacturers strive to make blades and turbines that are more reliable, and can withstand natural phenomena such as lightning. These designs attempt to provide “preferred” current paths for the lightning current; conductive meshes over the exterior of the blades, lightning receptors (preferred lightning attachment locations), and large down conductors, help carry high currents safely to ground. All of these precautions require highly-detailed planning that includes proper grounding of conductors, shielding of signal wires, wire routing, providing parallel current paths, etc. Despite the complexity of these designs, the benefits are significant; the effects of lightning are not entirely negated, but damage can be significantly reduced – instead of a total blade replacement, getting the turbine up and running again becomes a maintenance and repair exercise. The repair may be straightforward, but it’s still physically demanding. Most modern wind turbine blades are several dozen meters in length. 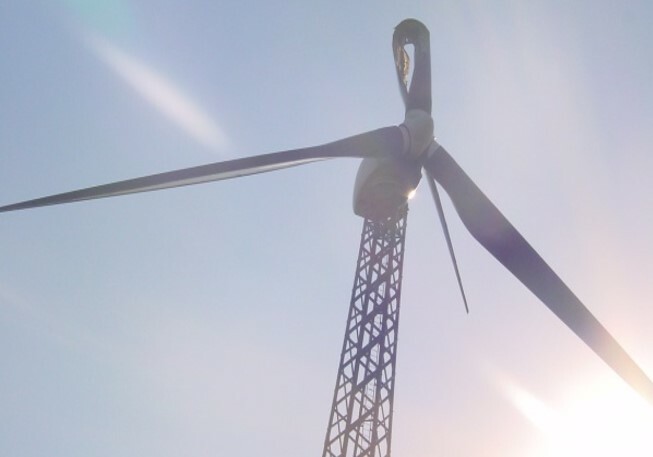 The turbine tower itself can extend 50-100 meters above the ground. Maintenance workers must climb the tower, or be carried up to the blade via a crane. The repair generally involves removing the exterior coating, prepping the damaged area for repair, repairing the laminate, and reapplying the exterior coating. The physics of nature make lightning almost unavoidable. Therefore, manufacturers must build an effective lightning protection design into the blade. 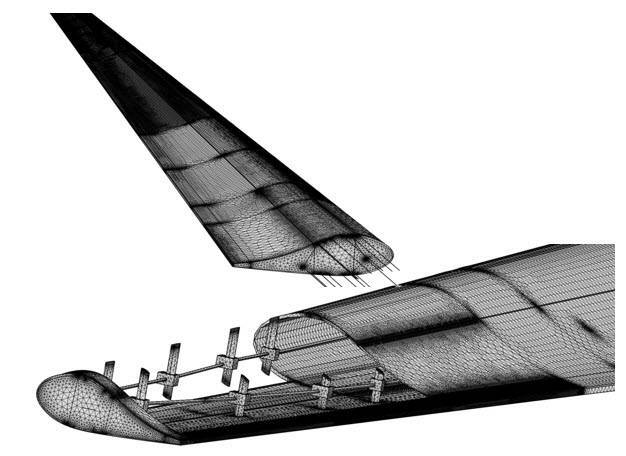 Most modern design approaches leverage a combination of numerical simulation and testing. Utilizing numerical simulation, electromagnetic models for wind turbine blades can be developed to analyze distributions between structural carbon, and surface protection layers. These models allow the determination of what is electromagnetically important, such as voltages or currents induced throughout the blade, including CFRP pultrusions, heater elements, surface protection layers, and down conductors. They capture critical design details such as material thicknesses, conductor routing, and receptor locations. Further evaluation exposes conductive materials and associated performance risks, such as arcing between blade elements, excessive current in structures, and induced transients into control systems. After modeling is complete, one or several candidate protection designs is proposed, intending to conduct lightning current with lowest potential for damage or repair. In order for the model data to be considered high fidelity, it needs to be validated by replicating exactly the measurements taken during laboratory tests, and comparing them to the analytical data to determine correlation. This is typically done with high voltage strikes, high current physical damage testing and induced transient tests. Lightning will always affect wind turbines. It’s complicated, and requires a well thought out design to reduce the severity of damage. If a good protection design is implemented, lightning damage can be reduced to a standard maintenance/repair operation, rather than a total loss. Justin McKennon is a Senior Engineer and Manager of Simulation and Modeling at the NTS Pittsfield, MA location that specializes in lightning testing and protection services. Justin has a Bachelor’s and Master’s degree in Electrical Engineering from the University of Massachusetts, Dartmouth. He specializes in simulating and modeling the electromagnetic effects of lightning on wind turbine blades, electrical components, aircraft, and other structures.